Sew Let's Quilt It is conveniently located in Dallas, providing long arm services as well as the best source for quality fabric. You provide the memories, the pictures, t-shirts, etc. We provide you a quilt full of lasting memories! Patty Kopeck, co-owner of Sew Let's Quilt It with her husband Tom, has been sewing all her life. She started sewing in her early teens with the help of her mother, then became more and more involved as her own family grew. She taught herself hand embroidery, counted cross stitch, needlepoint and machine embroidery. As her family grew and she had more available time, Patty began to sew for the public. She made more advanced projects, such as custom drapes, entire baby room décor and even costumes. Her love of fabric and textures eventually drew her to quilting, which is what she loves the most. She made her first quilt all by hand, pieced and quilted. 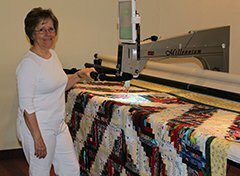 After that experience, she appreciates advances in machine piecing and quilting that allow projects to be completed in a shorter amount of time! Patty has a real passion for what it takes to find, make and complete a quilting project. She continues to attend national and local shows, take classes, read books and listen to the experts and creative people in the field. She is a member of the American Quilters Society, Quilters Guild of Dallas, Garland Quilt Guild, Quilters Club of America, The Quilt Show, and the International Machine Quilters Association, Inc.